Around My Edible Garden, March. I have been recording my vegetable garden activities in a hard covered journal for the last four years. It documents the sequence of planting in our 14 garden beds, as well as recording garden fantasies, drawings of fabulous arches, borrowed designs from garden visits. But there are no photos of each month’s results. Let’s face it, written journals are portable, flexible in style and very ‘Victorian’ when it comes to gardening but blog journals allow one to creep on all fours amongst the plants with camera on Macro, capturing the flowering, fruits, beetles, and worms. when the day time temperature isn’t too hot/cold. If it heats up too much, I throw on my ‘dog beds’ for protection. These perfect conditions usually occur in Autumn and Spring, the busiest time in my garden. Crop rotation ( hence the need for a written journal, with numbered beds). Crops such as silverbeet (chard), lettuce and parsley drop seeds in the same bed year after year, depleting the soil of essential minerals. I now move them along as they pop up. I attempt to rotate tomatoes throughout the beds, never planting them in the same spot for two years. I have also removed potatoes from the beds completely, growing them in containers as they tend to leave small potato seed behind, which have a detrimental effect on other crops, especially tomatoes. Leaving beds fallow for a season is also advisable. Like us, they need a rest too. Companion planting is great for bug reduction. Certain plants like each other, for example, tomato and basil, but this includes growing nasturtiums and french marigold. I let curly endive and radicchio go to flower each spring: their blue colour attracts bees and assists in fertilising the summer crops. The best specimen of any plant is left to go to seed for collecting. I rarely buy seeds. I have one lettuce variety that has been collected from my gardens for 25 years. Mulching is essential to keep the plant roots moist in summer and warm in winter. I use pea straw. I used to use Lucerne, which is dynamic but it tends to drop too much weed seed. Composting in layers- one part green, one part brown, one part manure- helps to keep the pile active and sweet, whether in a closed or open bin. Newspaper is collected and shredded by hand- the ink dyes are vegetable based. Leaves are collected too. Manure comes from our three cows and assorted chooks (hens). The kitchen provides the rest. In spring grass clippings are added, as well as an occasional sprinkling of ash from the open fires. There is always plenty of material about. Documenting the crop each season is also important. 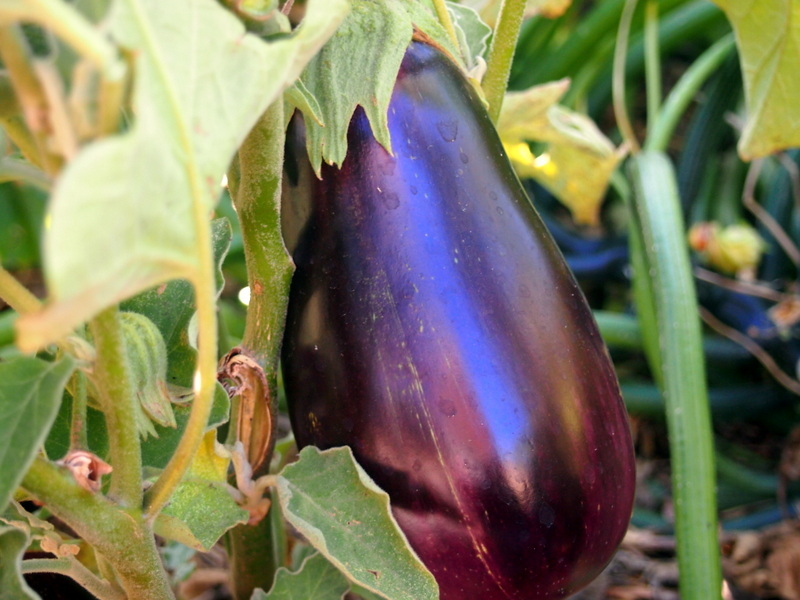 This March ( 2014) is the year of the eggplant. Last year, capsicums ( peppers), the year before, tomatoes. We do plant all these crops, but each season, one crop ‘stars’ due to the weather conditions. Of course zucchini will always do their thing! This season’s garlic bulbs were huge in size due to abundant Spring rain: last year’s lot were much smaller due to a dry Spring. Do you have a vegetable garden? How big is it and what system works for you? Do you rotate crops or grow herbs in pots? Are our summers getting hotter? Do you grow your veggies in separate beds or in amongst the flowers? What are the main pests or problems? Do you share the abundance or make preserves? Do you have an orchard and what is your best crop? Please leave a comment and if you like, add a link to your vegetable garden round-up for March in the comments below, with stories or pictures or both. Also refer to my blog in your garden story so that it can be included. This will become a monthly event for me, and I hope you can join too, to document our success and failures in the garden. This is such a great response from Davide, I am moving it from comments to this spot. We preserved our basil and made homemade pesto, which was incredible! And pickled loads of veggies “ Italian style” …mum helped me out with that and we are still eating to this day. I forget the Italian name for that. I will give them one more go, before I pack it in and only grow the cherry tomatoes. I will be purchasing a couple apple creates in the next couple of weeks to build on what I already have, so would like to use them for my leafy greens! 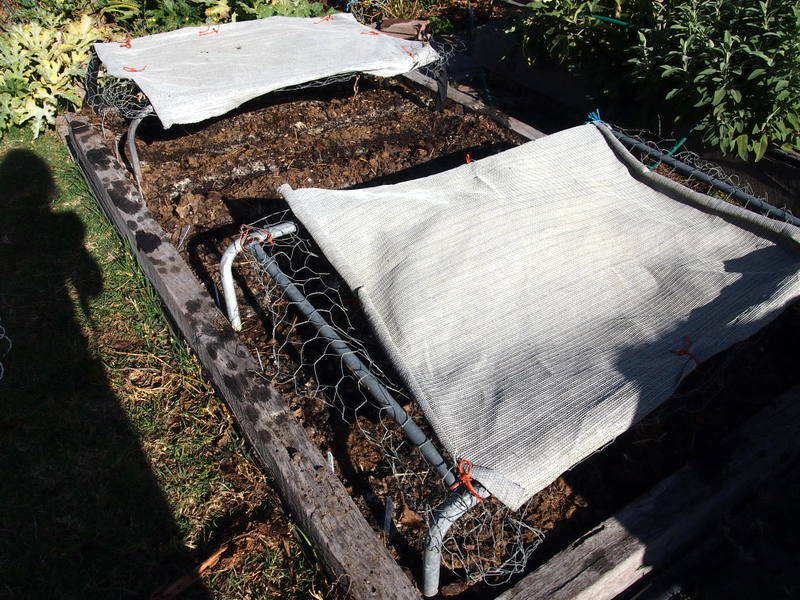 I love your idea with the dog beds to protect the seeds. I have loads of problems with falling leaves ect with my seeds. Also check out this delightful edible garden from Deborah ( My Kitchen Witch) in Sheffield, UK. Romantic stone walls, Morello cherries, herbs and bay trees, gooseberries look so romantically English and historic. No vegetable garden for me. I tend to kill plants but I do admire those than can grow things! Just a few herbs in pots maybe??? Your eggplants are beautiful! I would love to have a vegetable garden but I’m hopeless at gardening. My small collection of herb pots only survive because my husband waters them! haha, herbs are so easy and essential. Good on you, Mr Husband of Stephanie. THanks, They are having a good year. What luscious shots! 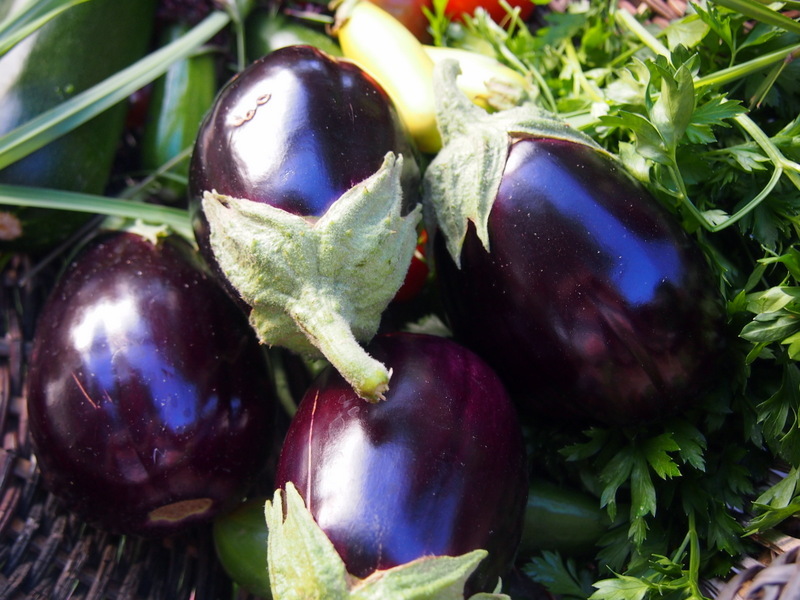 Now I want to eat some eggplant–maybe in some pasta alla Norma?? You should like a real garden pro. Brava! Yes, might whip up a Pasta all Norma soon. It’s my favourite veg ! Si, Fiori di Zucca sono i miei favoriti anche. Apparently seeds germinate much faster during electrical storms. Something about the nitrogen in the soil being released. Plants certainly seem to grow overnight after lightning. I would have been beside myself to have a vineyard like your father had. I guess he had much joy from his vegies in the time he had. Thanks Davide, and I loved your response. I love your idea of “stealing kisses” from the garden now that you are busy with your son. It’s a lovely image. With tomatoes, I now leave all the leaves on as in Melbourne it the leaves provide some protection from the blistering sun. If you have dappled light, it is probably worth pinkcing them out. Apple crates are a great way to make more space in an urban garden, Apteds in Strathewen have them for a resonable price. The dog beds are also haby to protect summer lettuce crops from bolting- again, becasue our patch is situated in full sun. I used to find old ones on council hard rubbish days, but sadly, this type of free recycling has gone in most areas. Sounds like your garden is going really well, with pesto and pickled Italian vegies- giardiniiera, or sott’aceto. Bravo! Do you have a blog? Lots of crazy spelling there Davide- next time, I’ll put on my specs. Oh Thanks Rach- if only we lived closer, we could have garden days. Nothing gets in the way of gardening, except bad weather, this summer in Melbourne for example. The garden is my siren, then comes cooking, then blogging. I would be tempted to stuff some of those zucchini blossoms. 🙂 I grow tomatoes at our cottage in Maine but the season is so short there. I can’t plant until the end of May because of the threat of frost and then frost starts appearing again in late September. Needless to say, I enjoy all the tomatoes I can harvest in that short time. That is a short season. We get frosts here too, usually at the start of winter, which finish off the basil, chilli and zucchini. But all my little winter seedlings have made an appearance in the seed beds so bring on the soups. So appetizing to see your fully grown vegetables. Of course, in the Northern Hemisphere, I am just beginning to get tiny seedlings for the same veggies. I, too, have large vegetable gardens and grow most of our food each season. The season is a bit shorter than in the rest of Virginia since we live in the mountains. But a greenhouse and large south-facing windows in our living room come in handy early in the year. I try to rotate my crops on a 3-year cycle so that I grow cabbage in the same spot only every 3 yrs (same with other brassicas, potatoes, and corn). 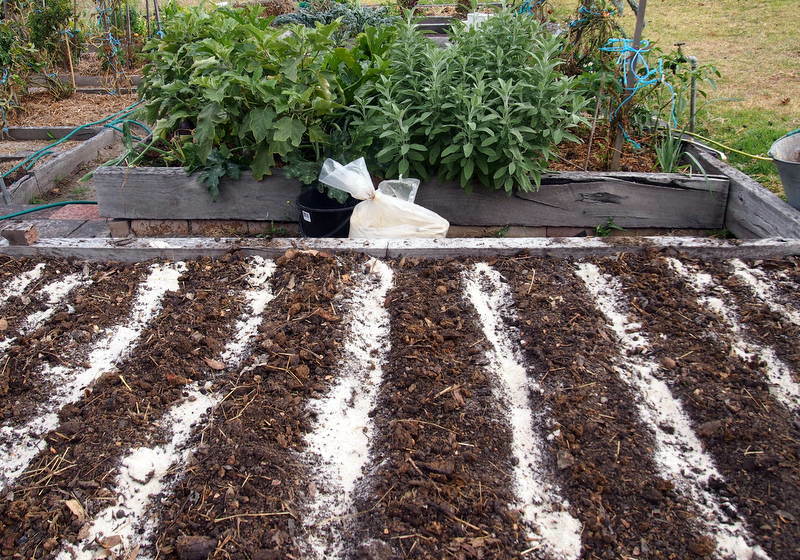 Beans and peas can fill in any gaps or can grow in the same space year after year. Since they are nitrogen fixers, they are good to intersperse with the heavy feeder crops. Are you familiar with companion gardening? Ah yes, we do practice companion planting. And like you, I use beans to fix nitrogen.I am about to do another post on our jobs for late Autumn, which includes sowing the broad beans. I often use my north facing window to grow seedlings for Spring inlate winter too. I must check your other posts. after that gorgeous moon shot! Previous Previous post: Fresh Fruit Charlotte, Lorenza de’ Medici’s Special Cake.